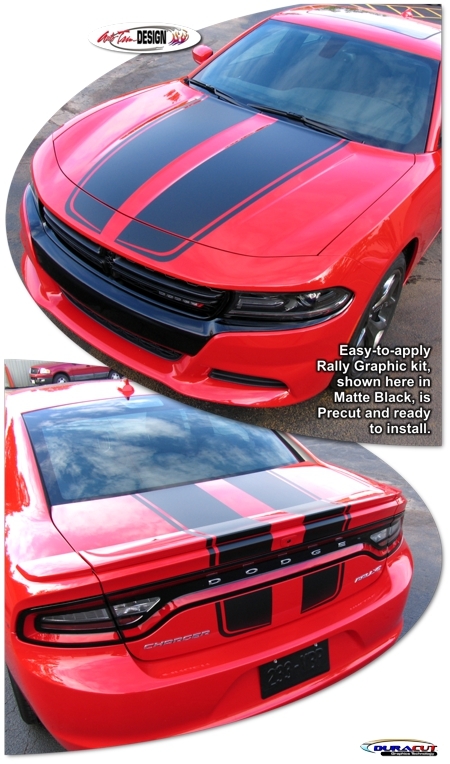 Make your '15-Current Dodge Charger "aggressive-looking" with this awesome Rally Stripe Graphics kit. This stripe package is not just a box of straight strips. Graphic kit consists of tapered, prefitted and contoured pieces as shown in the illustration - straight stripes will not work on this vehicle. Thus, due to the fact that this kit is created specifically for the '15-Current Dodge Charger it will not fit any other vehicle. Stripes require 5" (12.70cm) center spacing at time of installation as per our detailed Parts List. Optional Roof Kit #ATD-DDGECHRGRGRPH64 consists of a two (2) piece kit. Trimmable Spoiler Kit #ATD-DDGECHRGRGRPH65 consists of two (2) pieces 16" (40.64cm) in length that can be trimmed during installation for custom spoiler applications. 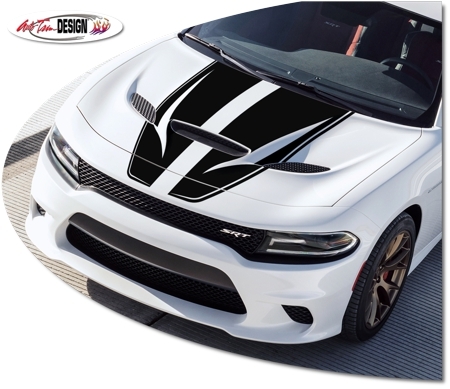 Due to compound curves and irregular surfaces of the SRT Hellcat's Hood, graphic pieces are designed with a unique and aggressive "fang" cutout to assist in application as shown in product image. Please refer to the Product Parts List for more reference.